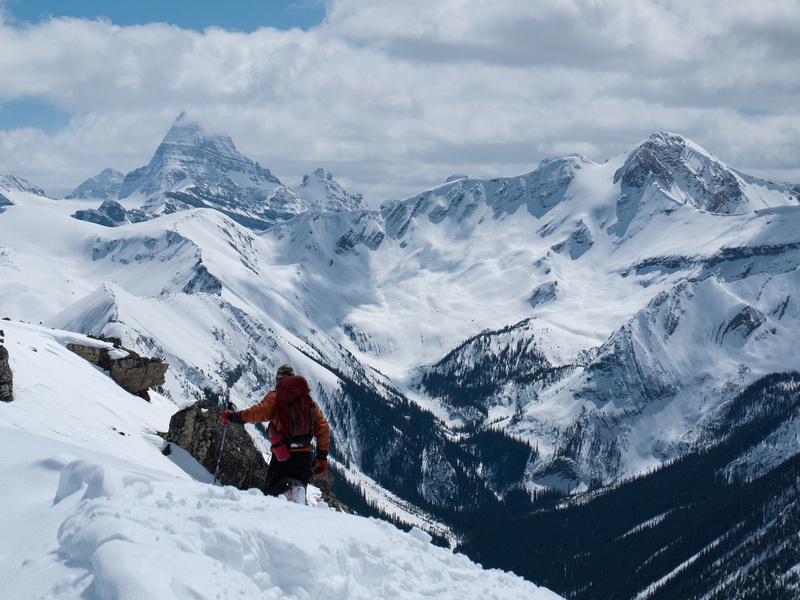 Difficulty Notes: While the summer ascent is fairly short and easy from Citadel Pass, the winter ascent includes serious avalanche risks. 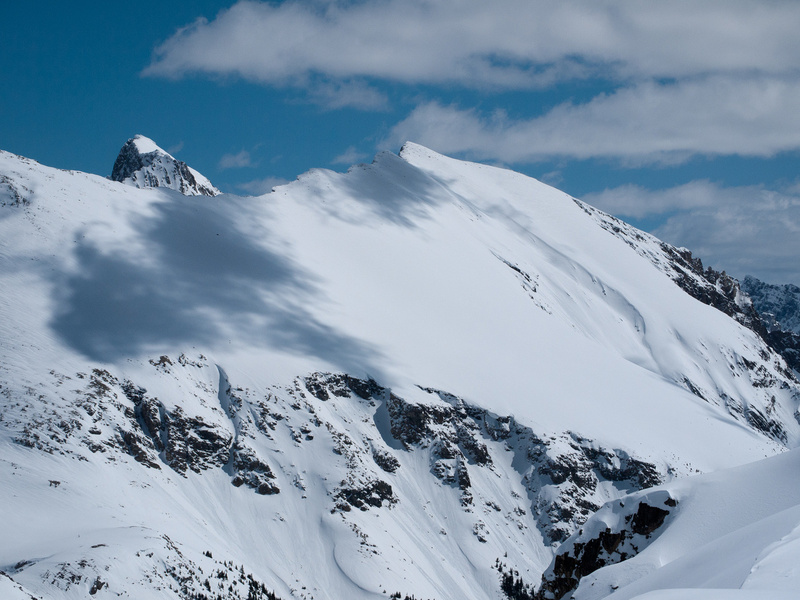 Learn how to manage these risks and perform avalanche burial rescues before attempting this trip. On a beautiful sunny, wintry May 1, 2011 I was joined by Raf and Mel on a ski trip through Sunshine Meadows to Citadel Pass and up Citadel peak. 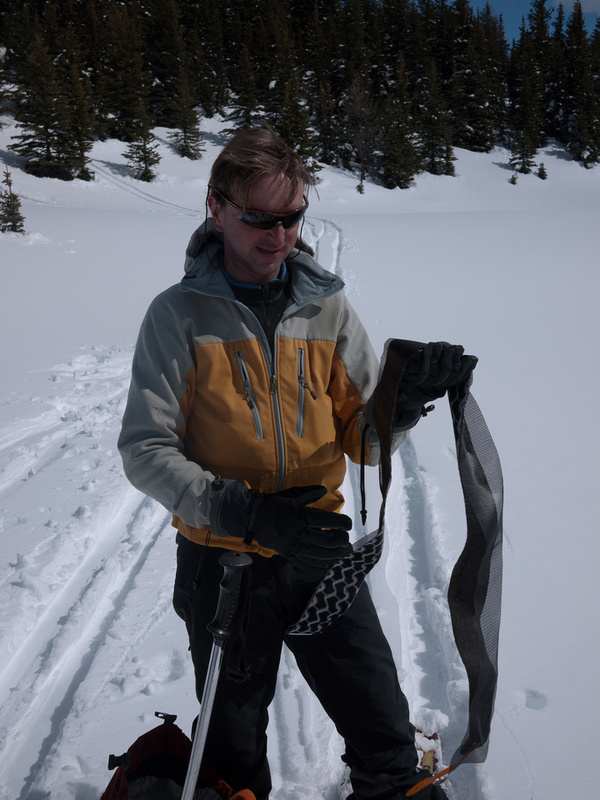 Our original plan (as per Raf) was to do a winter ascent of Fatigue Mountain but due to an unusually snowy winter we ended up on Citadel instead due to an extremely wind loaded west slope on Fatigue. See the bottom of this blog for the winter trip report. 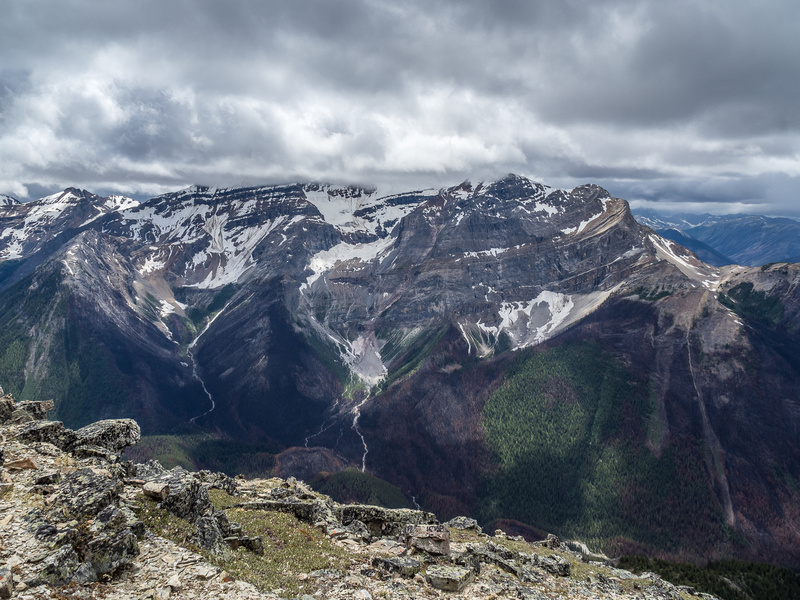 I repeated Citadel Peak again on a much less wintry, but also much cloudier day on June 29, 2018 as part of a three peak extravaganza with Phil Richards that included Fatigue, Citadel and Golden Mountain. 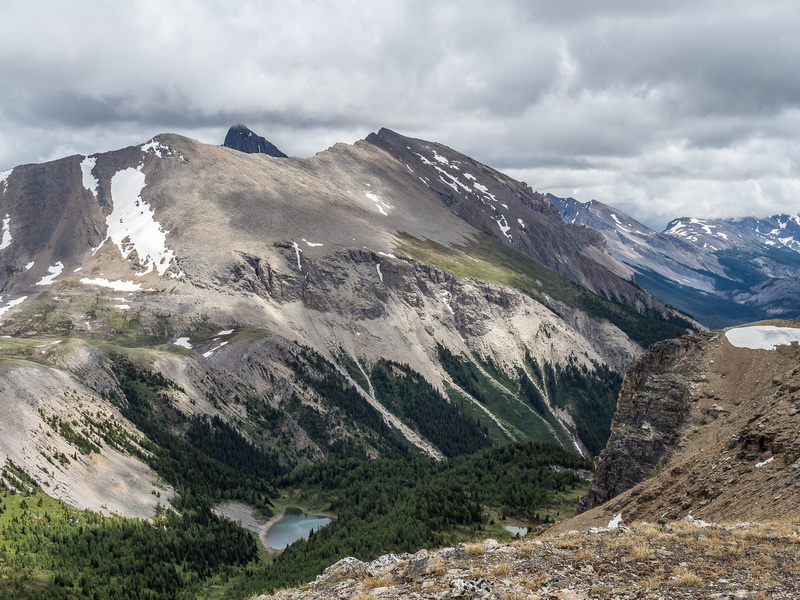 After a cloudy but pleasant ascent of Fatigue Mountain, Phil Richards and I found ourselves with plenty of daylight left (days are long in June) and enough energy and decent weather to tackle the much smaller Citadel Peak. 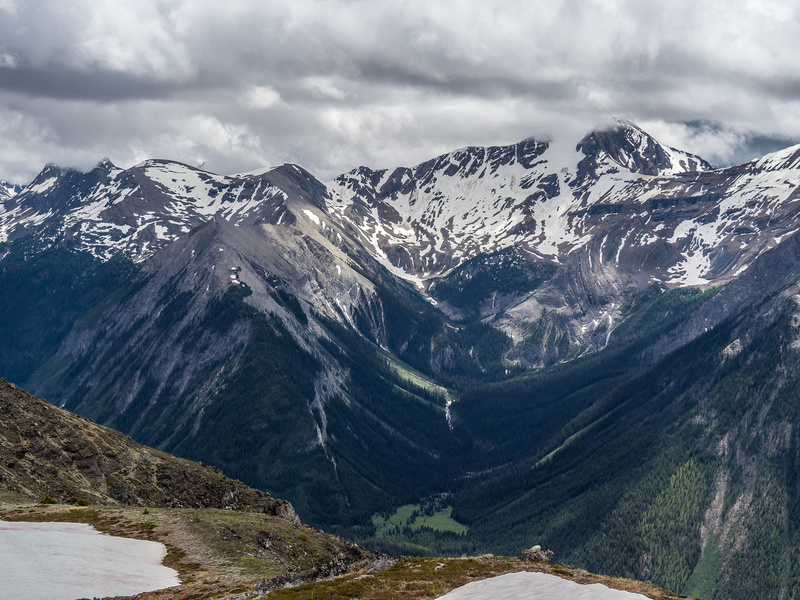 We knew from Fatigue that we’d likely get a good dose of cloudy views from the summit, but we were currently experiencing some rare sunshine and didn’t want to squander the opportunity! Considering the fact that any peak today was a bonus with the weather conditions, we were quickly converting a “meh” day into a very successful one. From Citadel Pass the route is obvious. 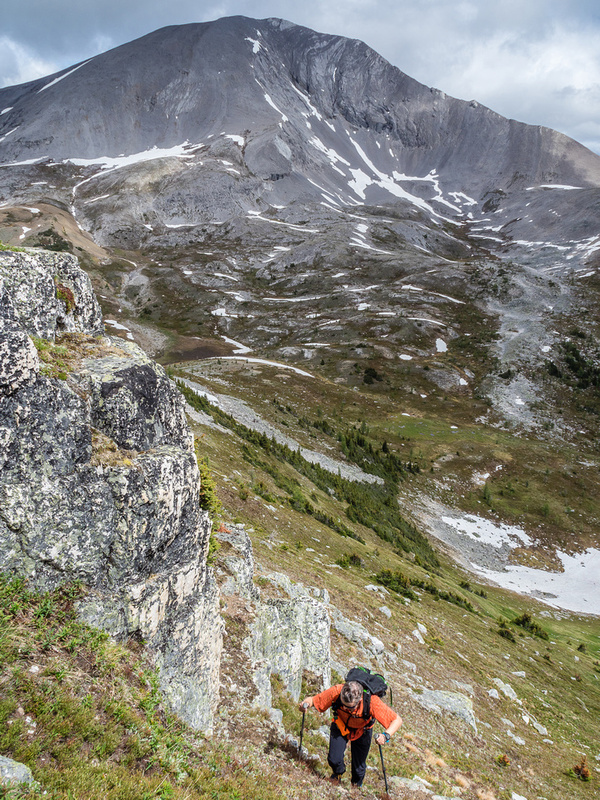 Just head up to breaks in the obvious cliffs on the east face of Citadel and scramble through them to the summit. On ascent we did a very short moderate scramble while on descent we went a bit further south and it was no more than steep, off trail hiking. Phil ascends steep grassy slopes with the summit of Fatigue Mountain still in the clouds behind him. 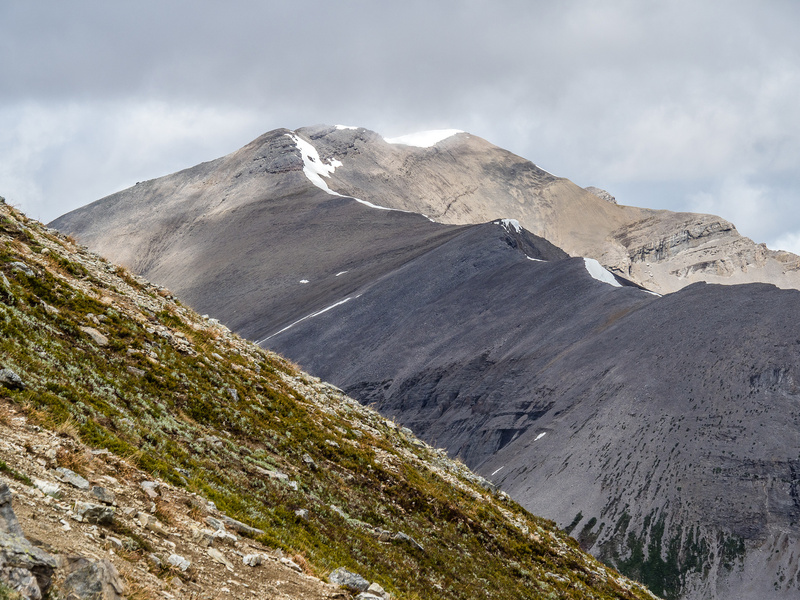 Looking past the eastern cliffs of Citadel towards Golden Mountain (L) and an outlier of Nub Peak at distant right. 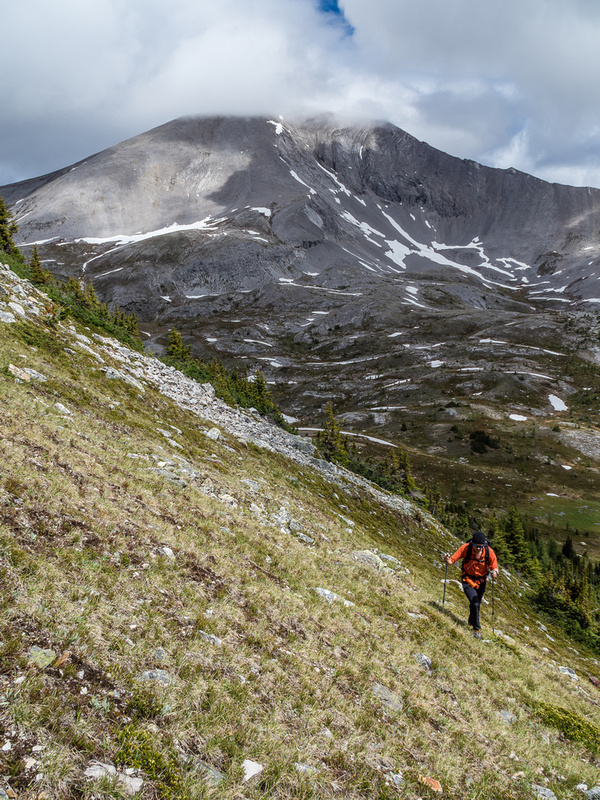 The slope gets quite steep – hikers probably won’t appreciate it. 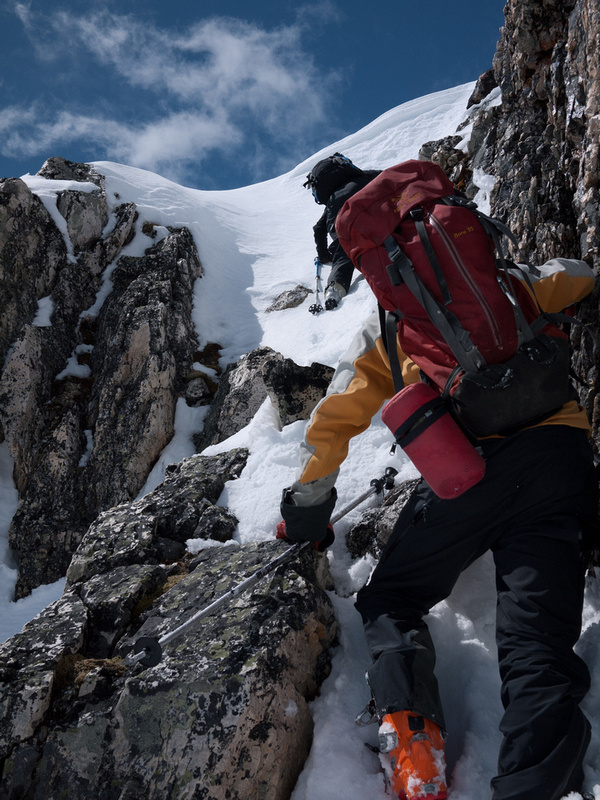 Phil breaks through the easy cliffs – note that if you aren’t on the easiest line, there are difficult options through here. Above the cliff band there was still about 100m vertical to the summit on very steep vegetated slopes. 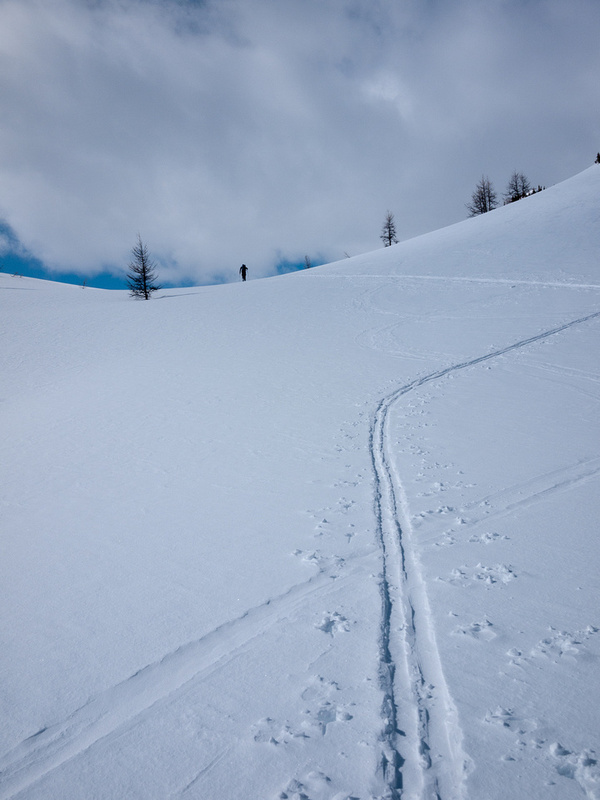 This slope, although easy enough, would be very slick with rain and presents an obvious avalanche hazard with snow. Views from the surprisingly rounded and spacious summit were some of the best we’d get all weekend thanks to the diminutive stature of the peak and our lucky timing. Just as we made the top, the clouds cleared and gave us some beautiful views in all directions. About 10 minutes later we spotted a storm heading directly at us and started to bolt back down the east face! 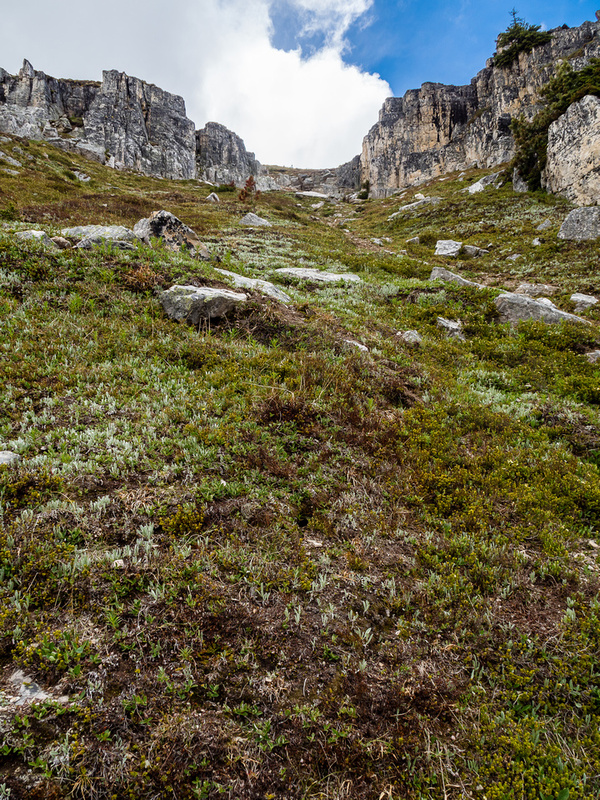 Very steep vegetated slopes to the summit above the cliff band. Golden Mountain at far left and Nestor Peak left of Simpson Ridge. Mount Shanks at right of center distance with Quartz Hill and Little Fatigue at right. Citadel Lake sneaks into view as I walk towards the north end of the summit block. There’s also a fast moving storm approaching at left here – time to bail! As the weather chased us down the east face of Citadel, I noticed an attractive looking break in the cliffs a bit further south from our ascent line. 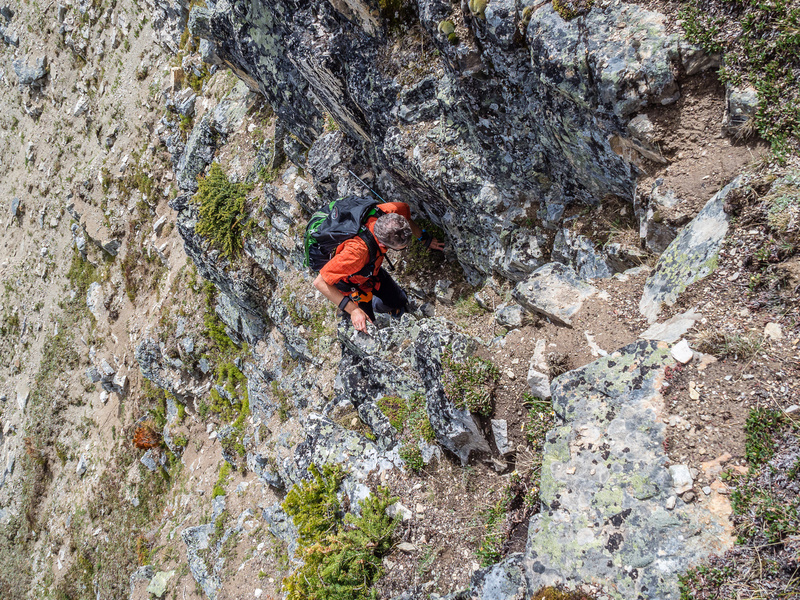 We plunge stepped quickly and easily down this steep break on a mix of scree and dirt which was delightful. 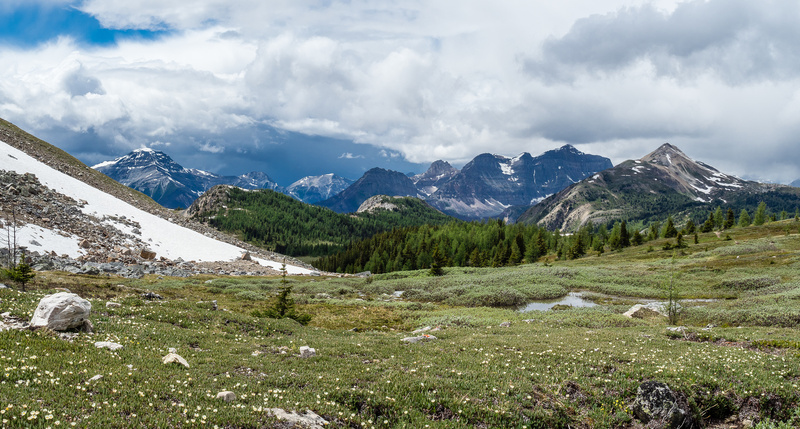 Golden Mountain and Mount Nasswald loom over an unnamed tarn at the head of Citadel Pass. Considering how prominently these peaks area and how accessible, it’s amazing how rarely they’re ascended. Citadel Peak seen from near Fatigue Mountain. 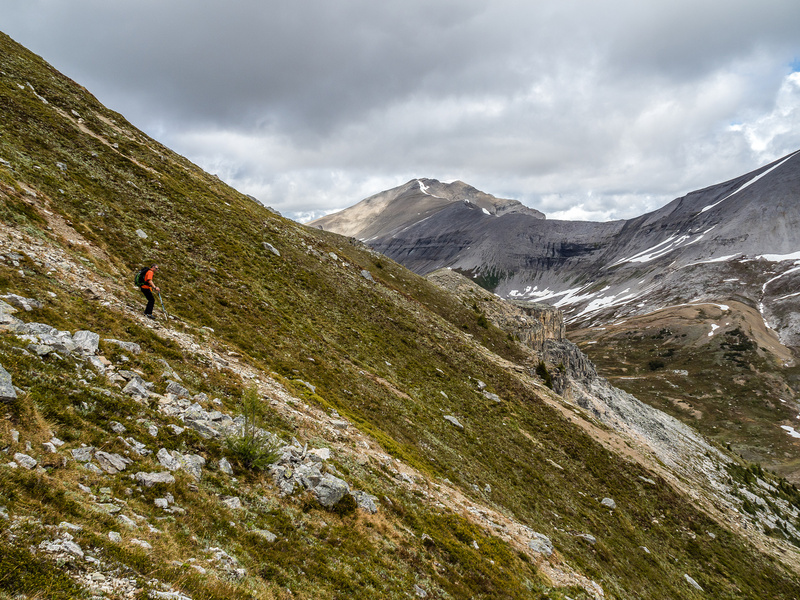 From the bottom of the break we side-hilled back to our heavy packs near Citadel Pass and continued on towards our planned bivy site somewhere near Fatigue Pass. Staring up at the east face of Citadel. We ended up traversing left to an obvious break in the cliffs. Our ascent line is obvious above. 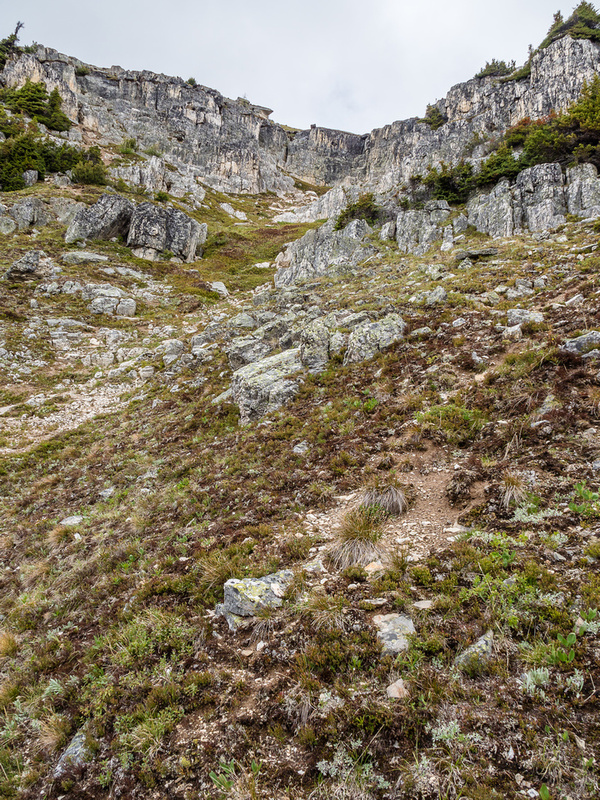 The slope gets quite steep - hikers probably won't appreciate it. Looking back at Fatigue and Golden (R). Phil breaks through the easy cliffs - note that if you aren't on the easiest line, there are difficult options through here. 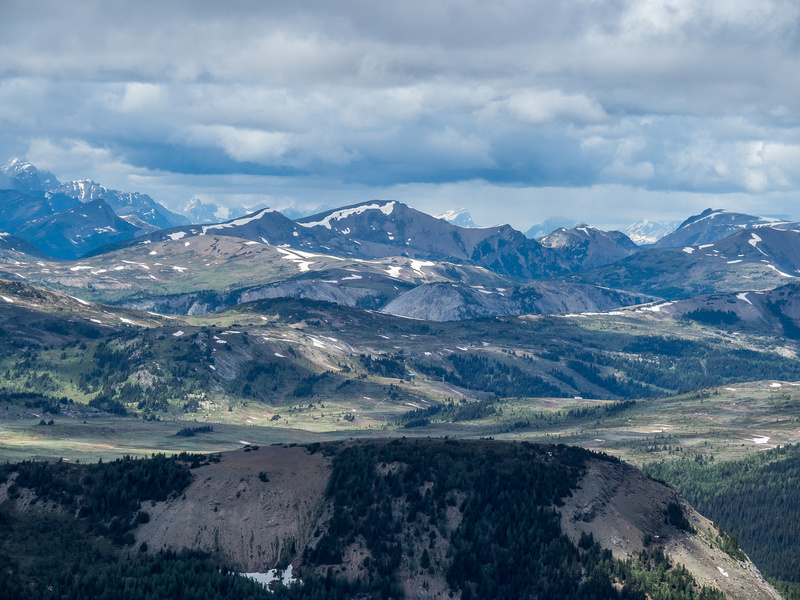 Gorgeous views over the Simpson River Valley towards Simpson Ridge (C). Golden Mountain at far left and Nestor Peak left of Simpson Ridge. Simpson Ridge is very difficult to access - especially after the Verdant Creek wildfires of 2017 which are pretty obvious here. Looking across the recent burn area towards The Monarch which is buried in clouds. Looking north over Quartz Hill towards the Egypt Lakes with Pharaoh Peak visible and Mount Ball in clouds beyond. 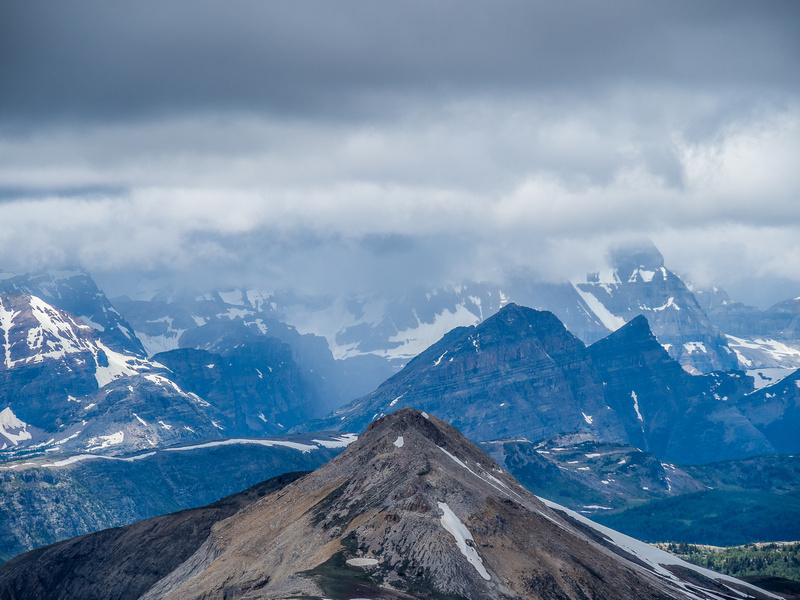 Summit views towards Pharaoh Peaks. Telephoto over the Sunshine Meadows towards Wawa Ridge. Looking north towards Mount Howard Douglas. 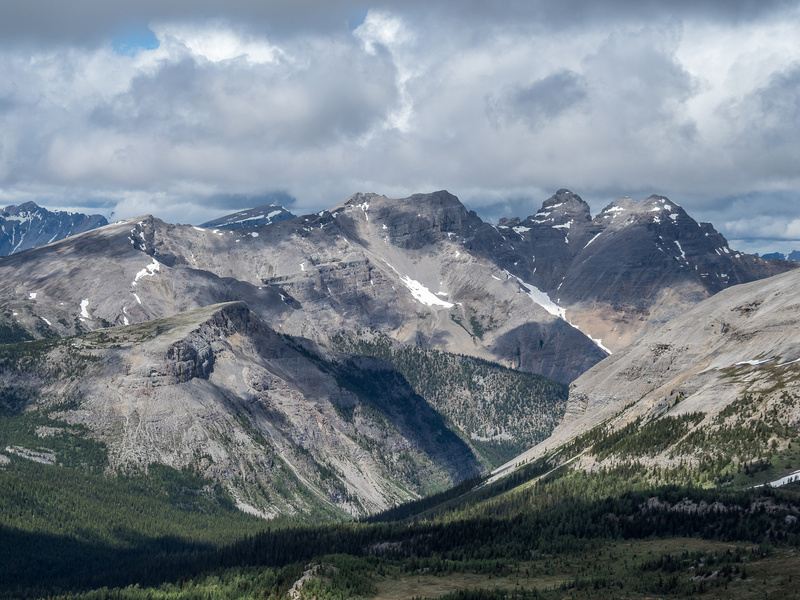 Fantastic views down the south ridge of Citadel, deep into the Simpson River Valley at right with Policeman's Meadows brilliant green at center. Citadel Lake sneaks into view as I walk towards the north end of the summit block. There's also a fast moving storm approaching at left here - time to bail! Looking over Fatigue Pass to Golden Mountain. 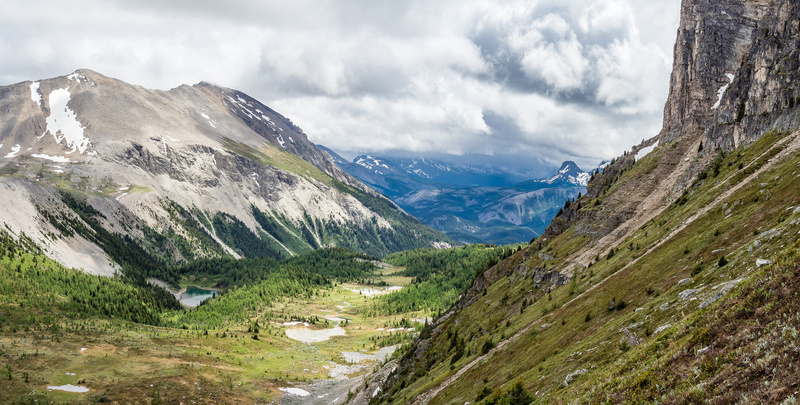 Golden Mountain and Mount Nasswald loom over an unnamed tarn at the head of Citadel Pass. Nestor Peak looms above Policeman's Meadow to the south. A telephoto into the Policeman's Meadow shows the rustic hunter's cabin on it's western edge. "Little" Fatigue's summit comes into view as we descend. 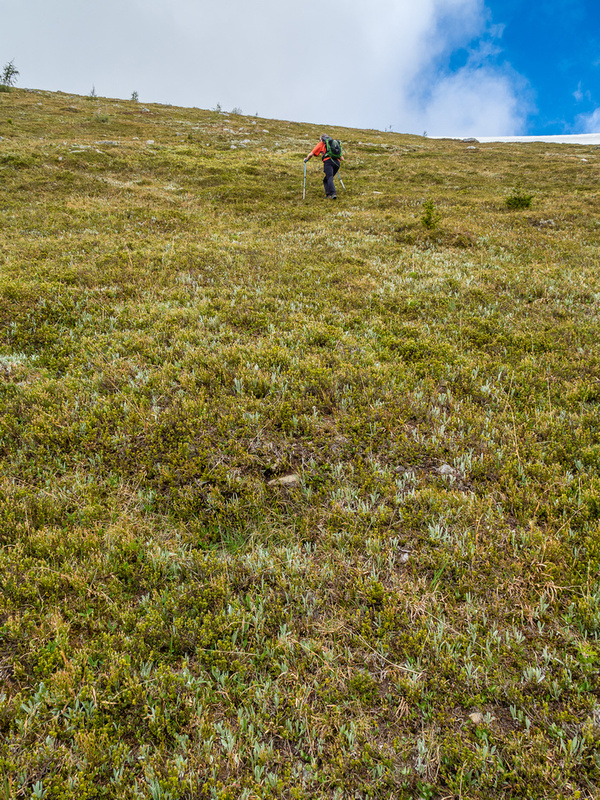 Steep vegetated slopes from the summit with "Little" Fatigue in the background. Fatigue Pass at left, Golden at right. Looking back up steep grassy slopes. 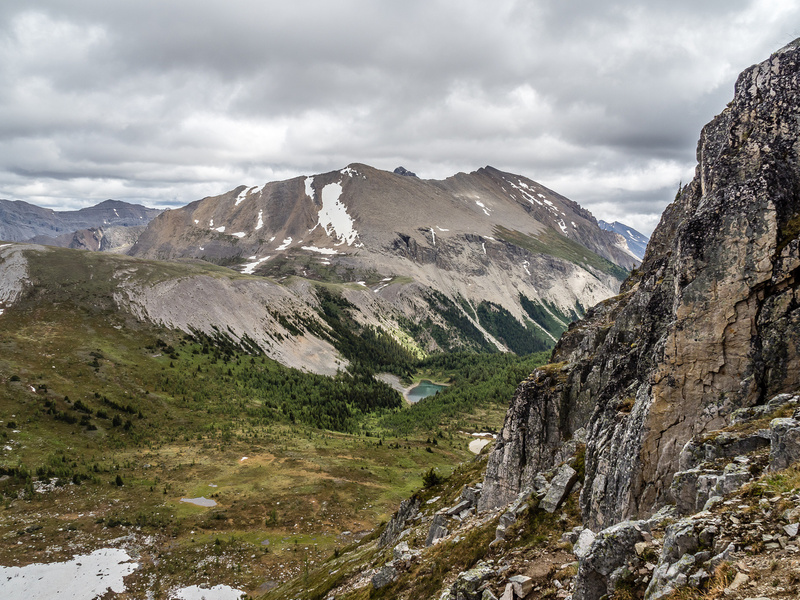 Looking towards Mount Cautley and The Towers (R). Looking back at Citadel Peak. 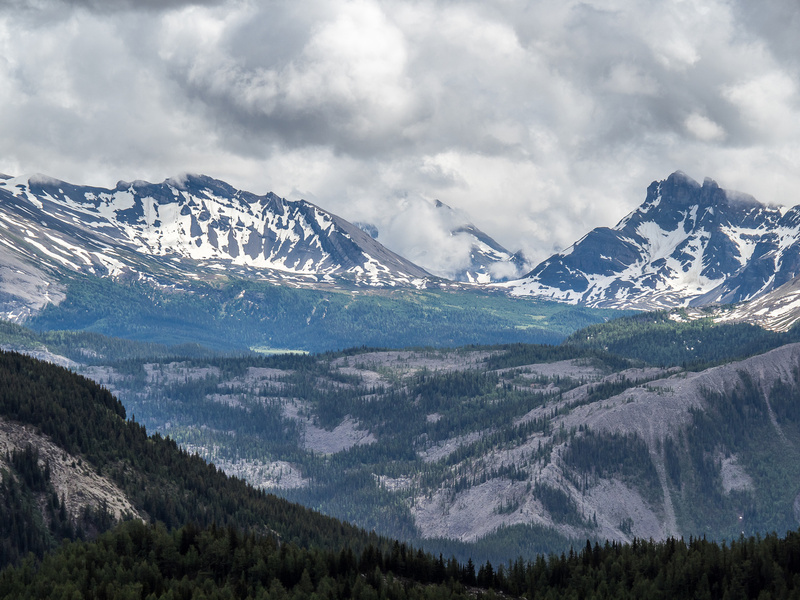 Moody weather towards Shanks, The Monarch and Quartz Ridge. The morning started out well, with a ski up the ski-out at Sunshine Ski Resort. Raff was hoping to take the gondola up but both Mel and I considered that ‘cheating’ and we kind of wanted the workout of skinning up the ski-out due to a planned ski trip to Castleguard the following weekend (which is a brutally long day trip). Because we arrived at the parking lot at 07:00 we didn’t have another option anyway, the lifts weren’t running yet! 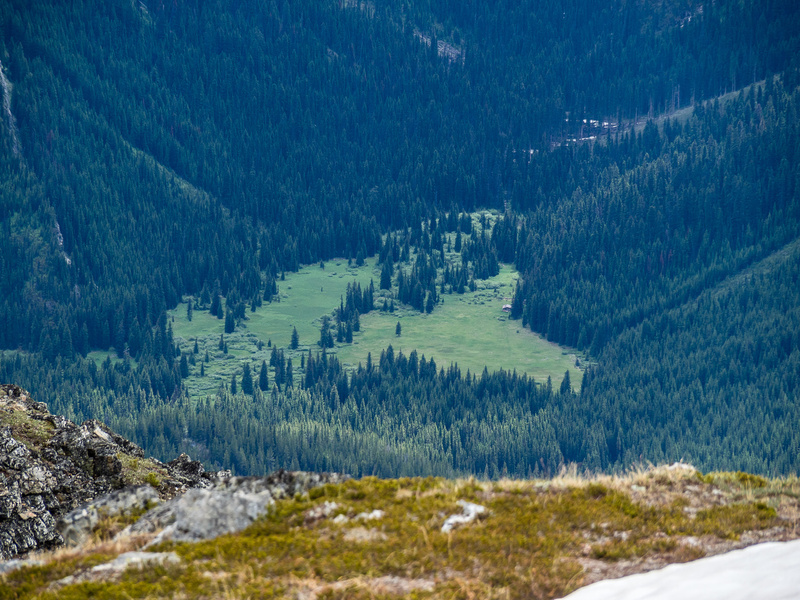 Once at the top of the strawberry ski lift, we had our first glimpse of Sunshine Meadows and our destination. It didn’t look that far, but looks are deceiving in a world of white. And it was certainly a world of white. 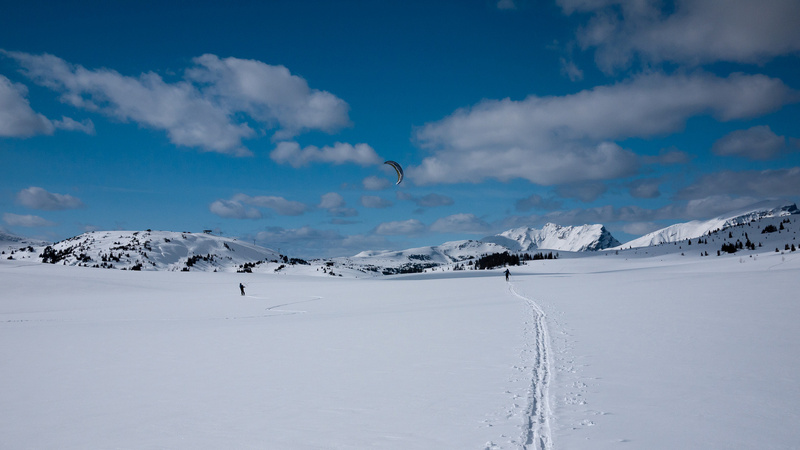 We couldn’t believe how much snow was in the meadows and plastering the peaks all around. Fatigue looked very snowy and Mel right away stated that the west / south slopes looked dangerously wind-loaded. 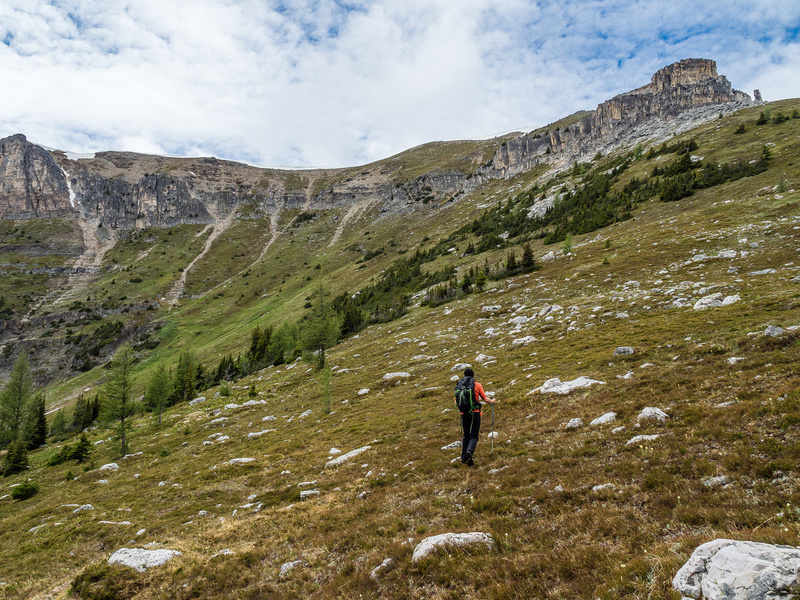 Raff and I weren’t ready to admit ‘defeat’ yet so we began our trek to Citadel Pass. The snow was extremely supportive and this didn’t change all day, even with a strong sun. The temps stayed cool (for May 1st!) so that helped. 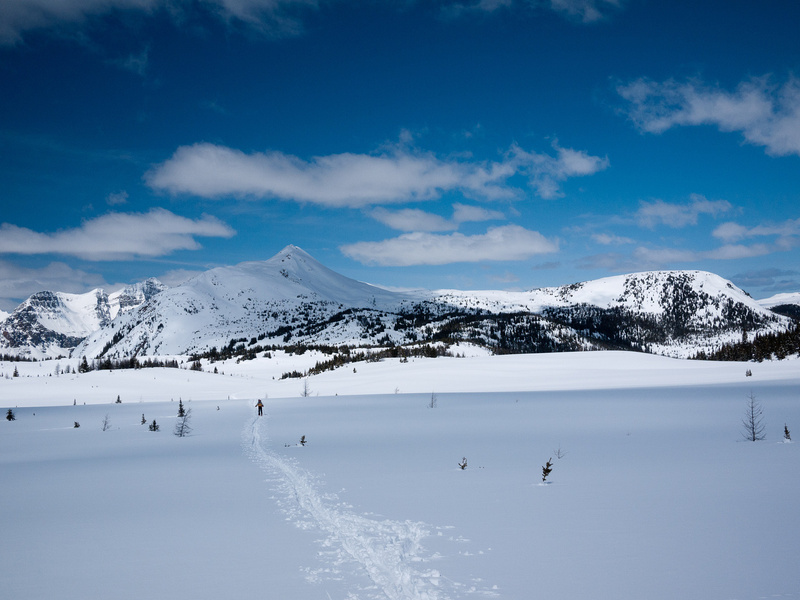 We couldn’t help but notice that nothing had slid on any of the surrounding peaks as we skied through the meadows and this was starting to make us a bit concerned, especially with a warm sun baking the slopes. 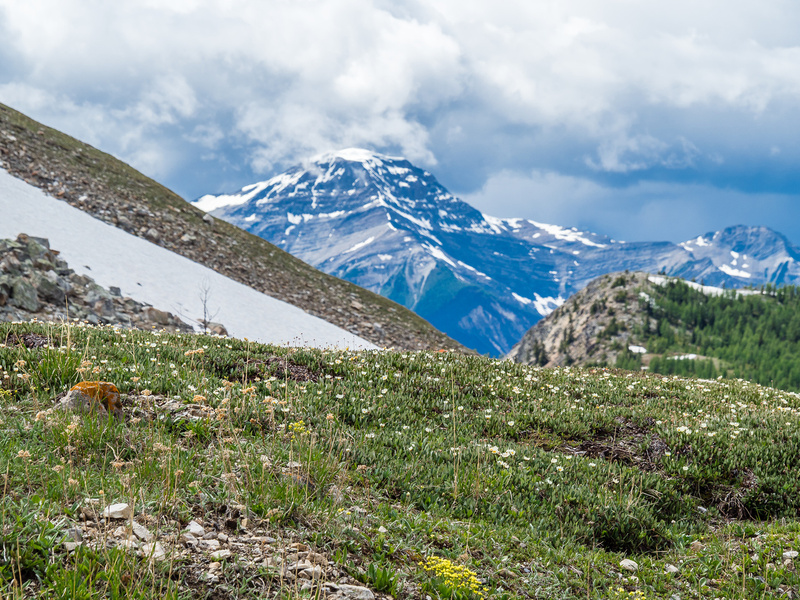 The trail to Citadel Pass runs along the west (right) side of the meadows, close to Quartz Hill before making a turn for the pass. This is to avoid unnecessary height loss, but doesn’t avoid all height loss. From just under Quartz Hill you lose quite a bit of elevation before gaining it all back to the pass. This section takes a lot longer than you’d think. We ended up swapping our skins on and off 3 or 4 times because of the rolling terrain. I think some kick wax would help tremendously here. Howard Douglas Lake in the foreground with Fatigue, Golden and Nasswald at left and Citadel at center in the bg. Citadel Pass views are incredible. 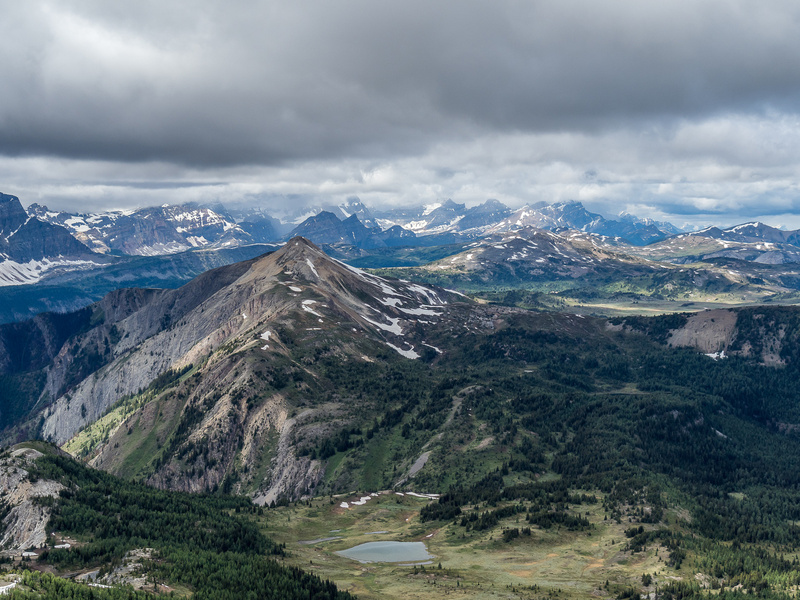 Golden and Nasswald on upper left, Assiniboine just right of center and Citadel out of sight to the right. Looking up gentle slopes on the south ridge of Citadel. The crux is tricky with snow! On the long summit ridge. Simpson Ridge at right, Golden at left. 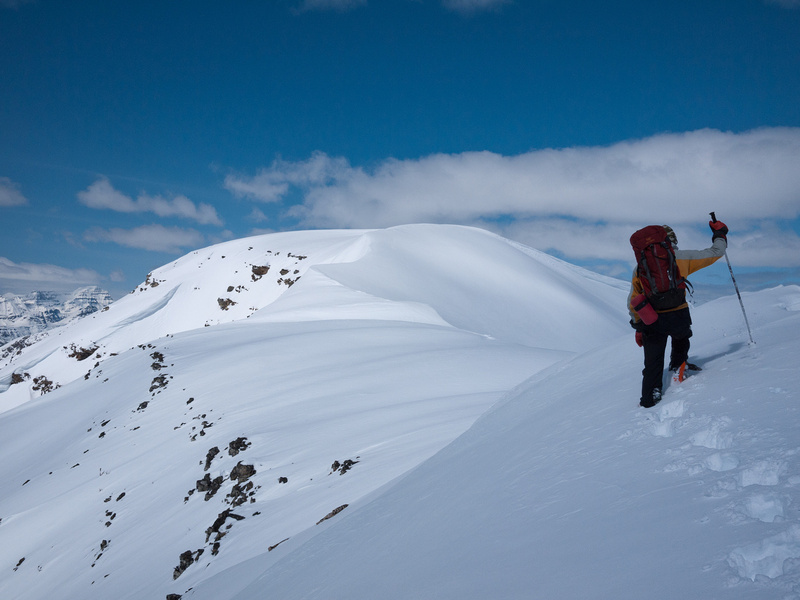 Traversing snow slopes to the summit. Looking north over the Sunshine Meadows from the summit. 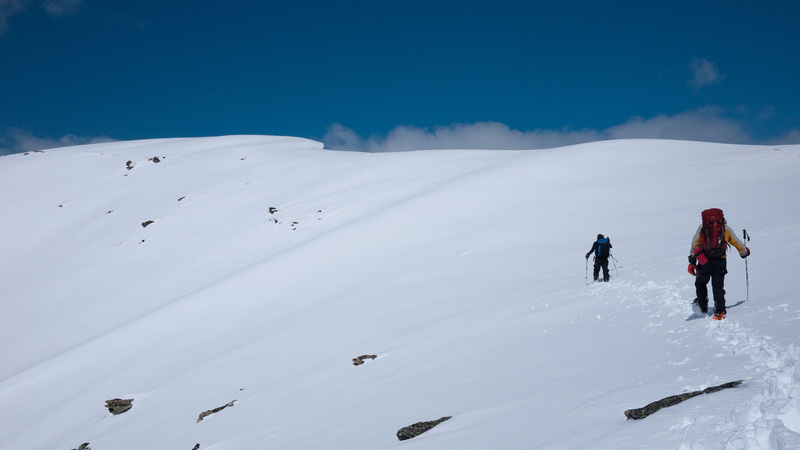 Traversing snow slopes from the summit. 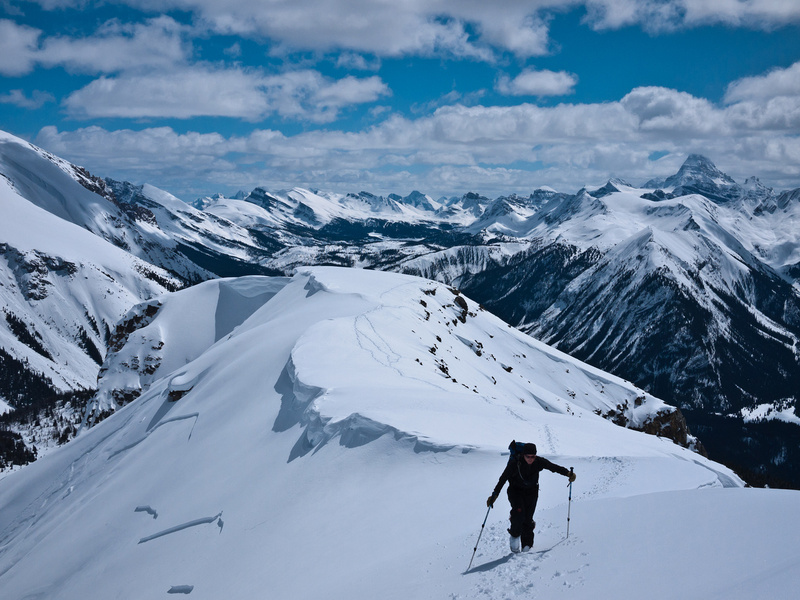 Skiing down the south ridge. Skiing back through Sunshine Meadows looking back at Citadel Peak. Skiing back through Sunshine Meadows. Skiing back through Sunshine Meadows - up from Howard Douglas Lake. At the pass we determined that there was no way we were attempting Fatigue! The west slope was baking in the sun, sections had already slid and most of it was still plastered with wind loaded snow. 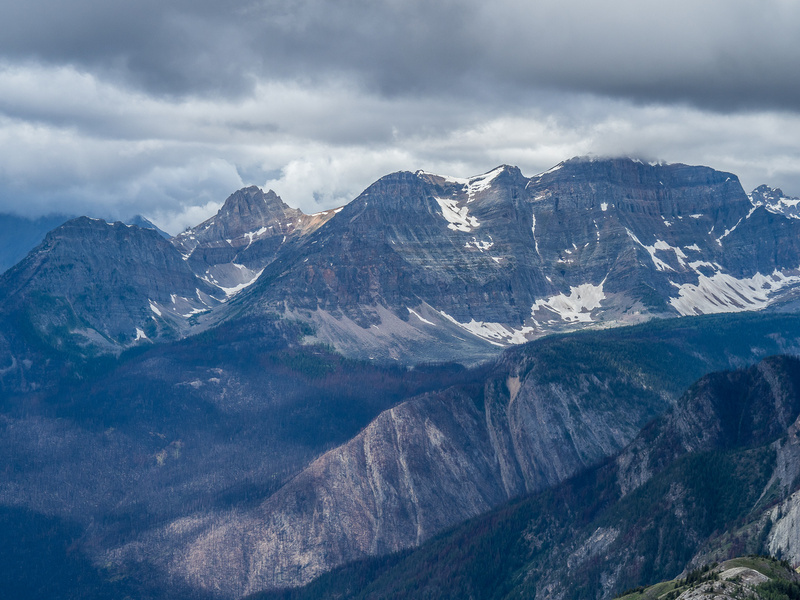 Our attention turned to the other side of the pass – Citadel Peak. 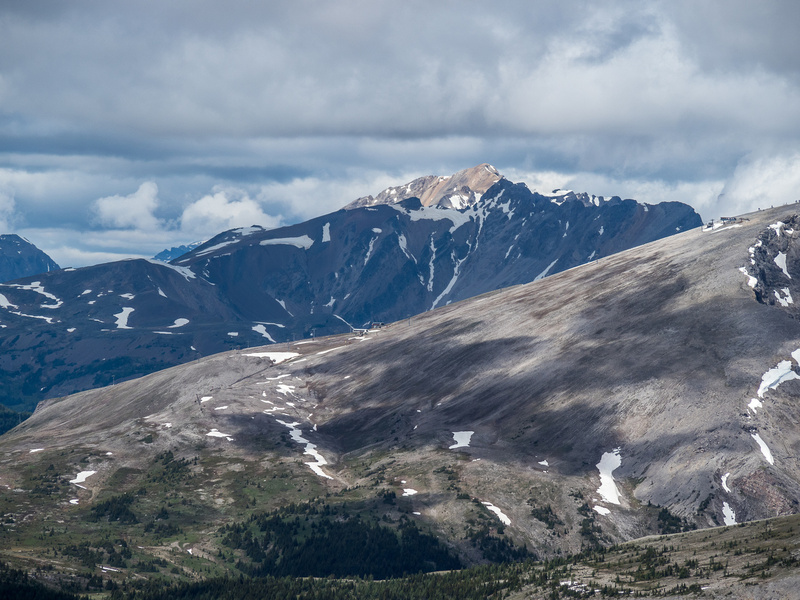 We knew that TJ and JW had ascended right from the pass but again, south / east facing snow gullies were loaded with fresh snow and already starting to sluff off the mountain so we weren’t going to subject ourselves to them. 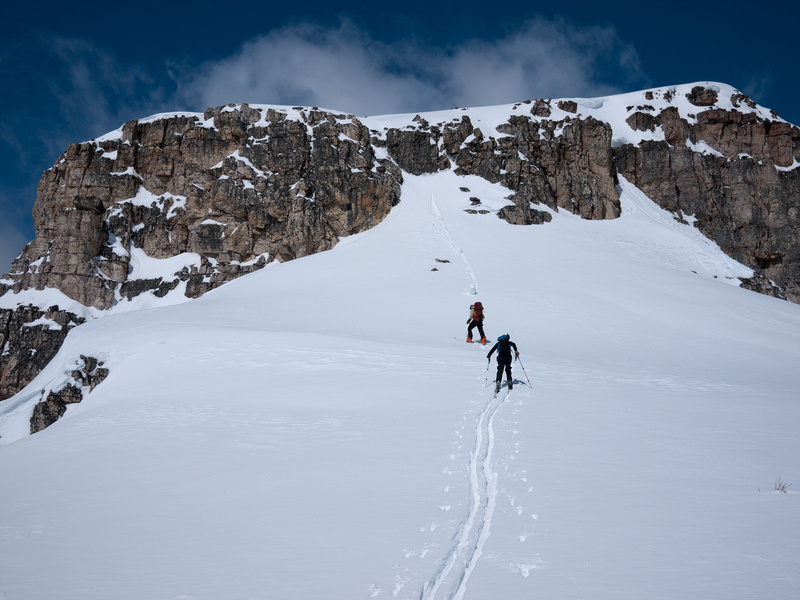 We decided to descend from the pass, traverse around the south side of Citadel and attempt the summit on skis up the gentle south facing slopes – hopefully they would be gentle enough not to slide. The theory worked well until the summit block where we were forced to take off our skis. 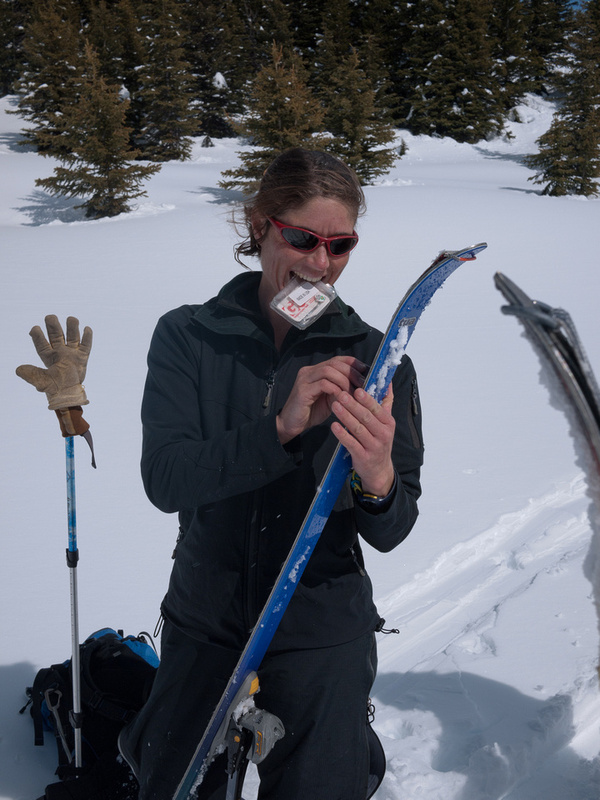 My skins were balling up like crazy so I knew I’d need some ski wax on the way out. 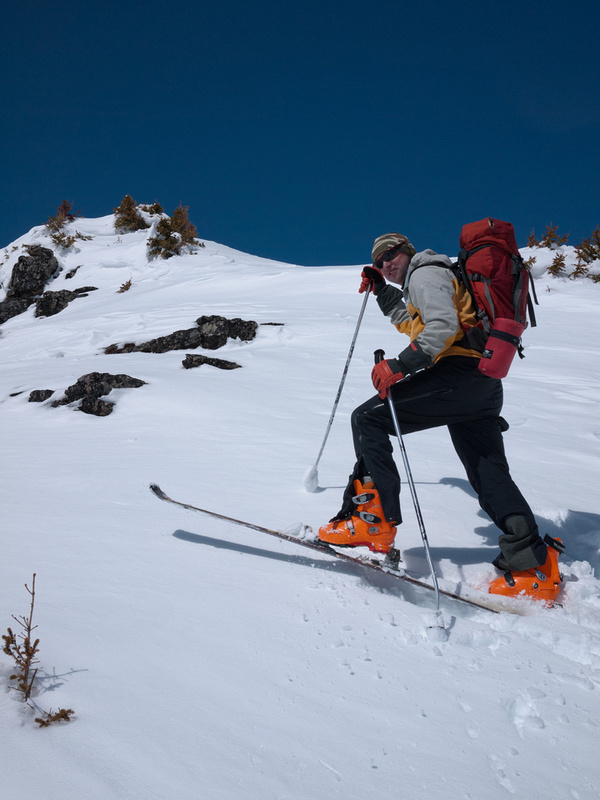 Skiing uphill with an extra 10lbs on each foot is hard work… 😉 A short cliff made this little peak as technical as Hector or White Pyramid but wasn’t a huge problem to get up. Once on top of Citadel we had to traverse some snowy terrain over to the summit, trying hard to avoid steep west slopes and a massive cornice on the east. Mel heard a loud ‘whump’ on one section which sent us much closer to those west slopes, back from the cornice! It’s probable that this ‘whump’ triggered the slides we noticed later on the east face when we descended back around the mountain. 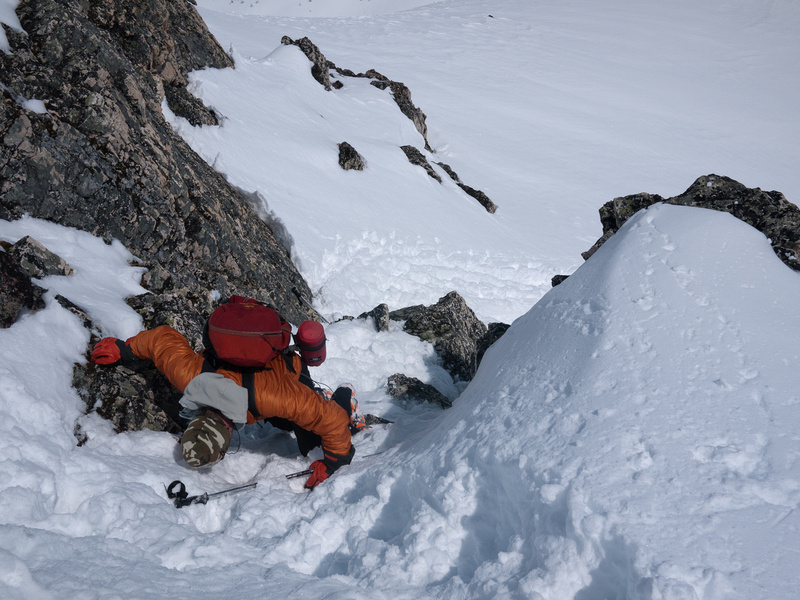 The final section to the summit was probably not a great place to be on this particular day. Raff led the way and we smoked up it as fast as humanly possible, one at a time. Once on top of this short section we could see that about 30 meters below it there was a very fresh fracture line and avalanche that had obviously broken off while we were coming up the south end of the mountain, since we didn’t see or hear anything earlier while traversing under the east face. This was sobering and we rushed to the summit and didn’t linger long before cruising down this same section as quickly as possible. 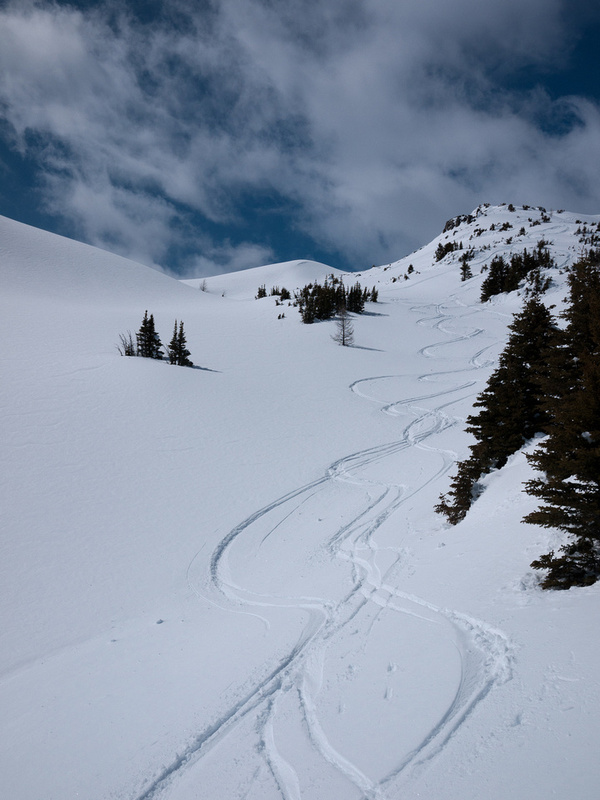 The ski down the south ridge was great – heavy corn skiing with some tricky crusts through the trees. The slog back to the car was uneventful but long. A great day out in great weather with great company!